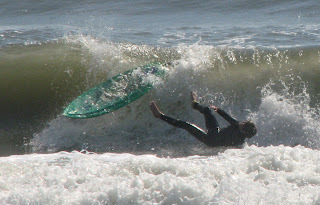 Reader Russell sent in this East-Coast layback pic that he found on The Happy Barracuda blog. Apparently, the pic was sent in by the reader's Mom. How nice. The Chips salutes this mom. That will teach the grom to stop talking up his game at school. WYD, do you have any pics of the mom? The board looks like its going to pull a bottom turn and bang of the lip - ghost rider.